When it comes to running a cost efficient and energy efficient data center, science is key. More specifically, the science behind tried and true tools and calculators can go a long way. Before you try to reinvent the wheel, check out DVL's invaluable resources, including several from Vertiv and Geist, that will help you optimize your data center's power and cooling. Learn more or get started today. Columbus, Ohio – (January 18, 2017) – Vertiv™, formerly Emerson Network Power, announced their Liebert®cooling products have earned the trusted AHRI Certified® mark through the Air-Conditioning, Heating, and Refrigeration Institute’s (AHRI) Datacom certification program, an assurance to customers of the products’ efficiency and capacity performance. 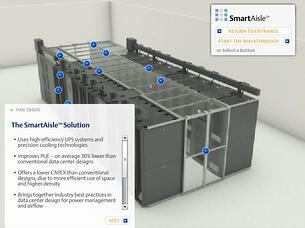 It's time to take two great virtual walkthrough tours of Liebert's SmartAisle and SmartRow solutions for Data Centers! The SmartAisle infrastructure solution optimizes infrastructure deployment and management with an intelligent row-based system that integrates data center racks, power, row cooling, aisle containment, monitoring and control technologies for spaces with up to 40 racks. The SmartRow infrastructure solution solves a problem all too common to IT management: addressing IT needs without building new data center space. 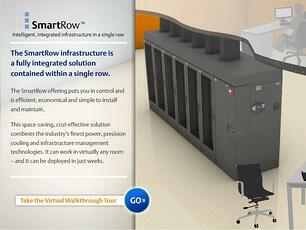 Think of the SmartRow approach as a data center in a row--a simple, fully integrated row-based infrastructure. The SmartRow offering combines up to six data center racks--with precision cooling, UPSs, power management, monitoring and control technologies, and fire suppression--all in an enclosed system. CLICK HERE To take the Tours!